I have not always been like this. In fact, I’m a big believer in having spontaneous fun, too. Yet now that I’m at home with my kiddos, I find myself CRAVING a routine. One that has been sorely missing in my household. Even though I recognize the need, I’m having trouble implementing. Something ALWAYS comes up, puts a wrench in my plans, and I *feel* like the day is ruined. Happy at our last, weekly clinic visit! On a POSITIVE note though… we are finally down to EVERY OTHER WEEK clinic visits! So next monday will be the FIRST time we do NOT have to go to Nashville in, well, since Annabelle has been home, as a matter of fact. I am so utterly excited! I try not to think about the fact that we SHOULD be down to monthly visits by now. I am choosing to focus on the positive. I have a confession to make. And it is not a very “Christ”-like one, but is very honest. While Annabelle was in the hospital, one of the big things I struggled with personally was jealousy. I’d see babies with similar heart defects come into the unit and sail through their surgeries. When I saw them happily going off to the “floor” or to home after only a week in the hospital… I would rejoice with them, but in private, had to swallow the lump of jealousy that sat (rather uncomfortably) somewhere behind my tongue. I’d have to deal with righteous jealousy, too, hen a little baby in the unit would fight so hard but in the end, became a fallen hero to CHD (Congenital Heart Defect.) Why God? Why did they not make it but Annabelle did? Why did they not make it but all these other babies are doing fabulous? I thought I left jealousy behind when we left the hospital. Finally, we were having OUR turn to live outside the sterile walls of Vanderbilt Children’s Hospital. Most days I do well and can focus on all the good things. I can be thankful. But I’ll be honest with you (and a LOT ashamed of myself.) I swallowed a little pill of jealousy the other day again. 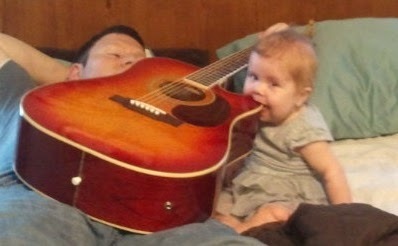 Remember baby Scarlet? 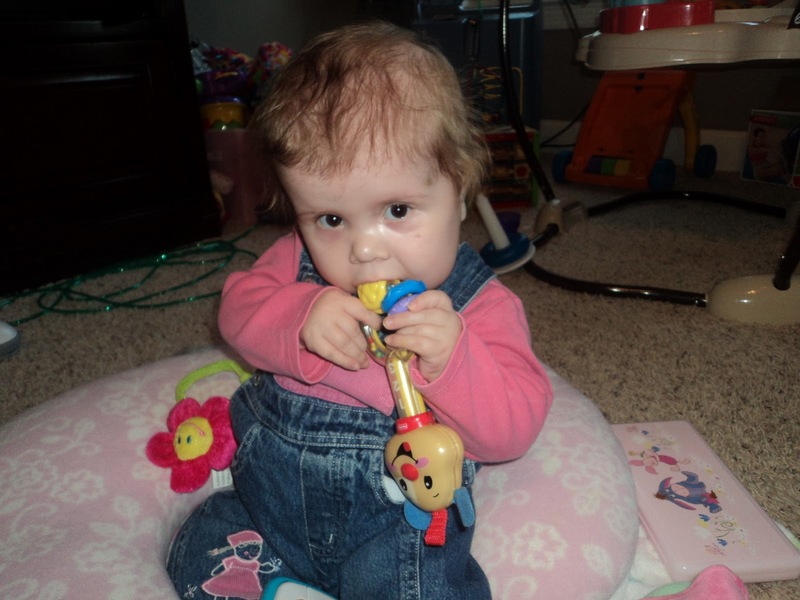 Who the doctors gave little hope of being able to survive until heart transplant? Who finally got her heart a week ago Monday? Well, she is doing FABULOUS! From everything I can tell from her mom’s facebook page, she is doing just amazing. She is on NO oxygen, is already eating by mouth, and they are talking about discharge next week! Don’t get me wrong. I am happy dancing for them. This news is SO very amazing and God is SO SO SO SO SO wonderful to bless them like this. To go from the doctors telling you to make a plan for how you want your baby’s death to go, to getting to take your baby HOME just two weeks later…. there are no words for how wonderful that is!!!! Can I get an amen?!? But, in my low, frustrated moments, I can’t help but be a little jealous. 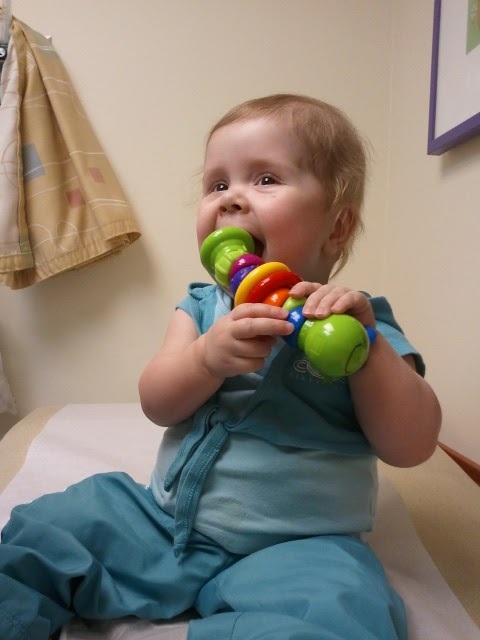 Annabelle spent over SIX weeks recovering from her transplant, including another surgery on her diaphragm. We never could get her off oxygen before coming home. And we have spent another 30 days in 5 different hospital stays since coming home, including suspected rejection, another emergency open-heart for her failing new heart, an ambulance/lifeflight ride which required CPR and emergency on-the-road intubation. Not to mention our continued feeding and physical therapy issues. I’m not having a pity-party. Okay, maybe a little-bitty one. One, so many people comment on how well I take all this. I just want to be honest and let you know I have huge down-times too, where I don’t handle it how I should. We’re all human. I’m thankful God understands and loves me anyway. Two, to ask for your continued prayers for our family. I am SO SO SO SO thankful for how WELL Annabelle is doing. But some days, many days, it’s just plain hard. She’s doing well. Still eating sometimes, not eating other times. We’ve introduced a sippy cup. Annabelle has introduced the sippy cup to the floor. We were able to go down on her diuretic to only once a day, which means she is peeing like a champ which we are SO SO SO grateful for! Stools are still not-so-pleasant, but not as bad as they have been. I won’t go into detail in case you are eating while you read this… HA! Otherwise, we are doing well! 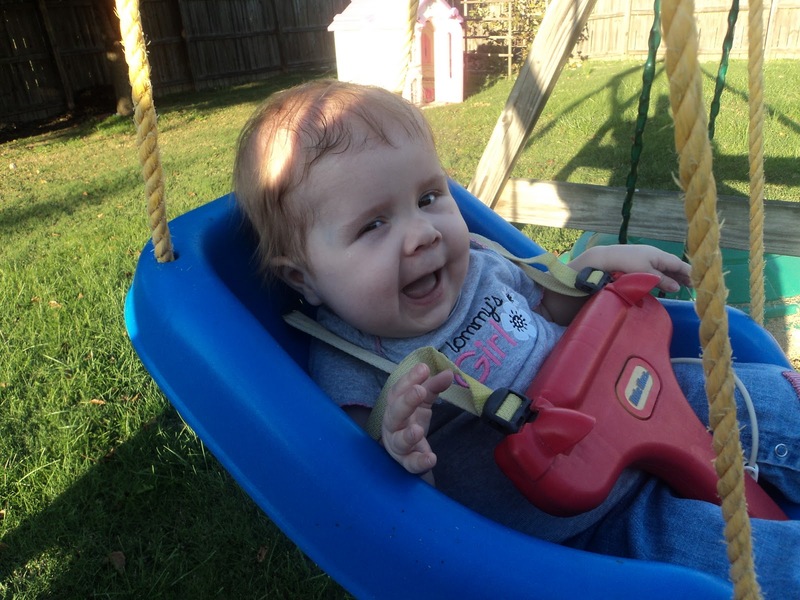 She got to SWING in her big-girl swing outside the other day for the first time!! She has now decided that instead of screaming the entire time, baths aren’t quite so bad. And the other day, Scott walked in the door, and she squeeled. The first time she’s done that! SO cute to hear! She frowned the whole time… until she saw the camera! So yes, while the green monster of jealous does sneak in every now and again, I am still oh-so-thankful for the blessings God has given us. I take no good day for granted. I think all of us CHD moms have dealt with the jealousy monster at one point or another but would never publicly admit it. I love your blog. It really helps put many of my own emotions into the words I never knew how to say. Continued prayers to your entire family!!! I know I for sure have experienced simultaneous joy and jealousy. I am THRILLED that Scarlet got a heart and is doing so well, but I too felt a pang because we lost Lincoln while he waited for a heart. It's tough. We each share unique struggles and run through a whole gamut of emotions. I appreciate your honesty. I imagine as a Christian especially that has got to be a hard monster to tame. I know last Friday I was on little Scarlet's facebook wall, reading how awesomely she was doing. Then I moved onto my own wall where I saw a cute little pic and then read "sleep in God's arms"..My heart sank and I cried "no God no, let it be wrong". It wasn't. Tears streamed as the story unfolded that night and I realized that the almost seven week journey my family had been on had ended. I wanted to ask why, I'd seen so many miracles this past year, followed so many stories, seen so many touch and go moments turned around and rejoiced with so many – why not for us, God? Unanswered questions. I've thought about how tough the road has been for Annabelle and how easy for others, though I know we're not family or anything, she means a lot to me and I've wondered why for her also. I appreciate your honesty and admire your faith. Anyway….Annabelle is getting so big and she's so beautiful! Praying for you everyday that her hard times will be behind her and she'll grow up to be happy and healthy with an awesome testimony! I know that jealousy well. I don't think I need to explain why. One of the hardest pills for me to swallow is why children get to come home and live with parents who could care less that they are even alive. They are abused, neglected, screamed at, put down. My child is gone. Died a year ago- yet these parents are blessed with the most amazing gift of healthy children and they could care less. Jealousy, anger, bitterness, frustration, and pity parties….all experienced at once. But it comes down to the fact that God is just and merciful and we just need to trust that- even if it's hard to understand. Just wanted you to know you aren't alone with your feelings. Boy I can relate that your post! Like Amanda says, all us CHD moms can relate. I remember one time when my son was deep in the throes of being sick….no more hope left for him and a woman brought her baby back to the floor to see the nurses and her baby was so healthy and she was so happy and I remember being so angry and just walking off in utter disgust. I couldn't handle it! And then days later a baby whom we knew died on the floor and I remember feeling so guilty that my baby was alive. I didn't know which emotion was harder to deal with. CHD world is a crazy world full of twists and turns like none I have EVER seen. WHEW! Bless you for being so honest with your feelings! Thanks, all you fellow heart mommas, for commiserating with me. You all made my heart feel good to know that I'm not alone in the struggle! !